I come from the world of professional speakers and I recently sat next to a speaker at a CAPS Chapter meeting who had been in the business for over 30 years. But recently, his health had become an issue. He was not able to get on a plane anymore. Without revenue beyond speeches, his work (and potentially his income) were in jeopardy. No doubt by now many of you have been thinking about creating revenue beyond books and speeches. Online training perhaps? Maybe membership platforms? I have to say, I’m thoroughly on board with lowering the percentage of your revenue that involves your time. In fact, the time may be here for you to “stop trading your time for money”. And it’s arrived for me. I’m in the throws of revamping my own business to lower the number of coaching calls I do every month. This was brought on because my calendar has been so insane lately, I actually was starting to think I wouldn’t be able to take a vacation. (If you know me at all, you’ll know that this is UNACCEPTABLE!) 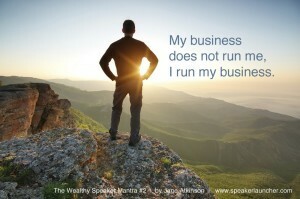 I run my business, it doesn’t run me. So what’s the solution? Well, for me it’s going to be an 8 week course that provides weekly coaching with me and a ton of great value. Our focus will be “Acceleration”. Who is the market you want to help? What is the problem you want to help them solve? What will the elements of your course be (audio, video, reading, etc)? How will you fill your sales funnel? (Often these things begin with a webinar). There are many programs out there that help you walk through the launch of an online program. Just be careful and know that there are a lot of moving parts to getting it working. See you soon Wealthy Speakers!